Republican voters gave Gov. Bruce Rauner another chance in Springfield Tuesday by a slim margin, the Associated Press projected, as the incumbent won his party’s nomination despite a strong challenge from the right. Rauner won 52 percent of the vote with 91 percent of precincts reporting as of 10:33 p.m., according to unofficial results. While he initially dismissed state Rep. Jeanne Ives as a “fringe candidate,” Rauner was forced to take the challenge seriously when she garnered the support of various conservative organizations, and even some former Rauner supporters looking to take down the first-term governor from the right. Rauner announced his own re-election campaign with a double-down on some familiar refrains, namely, a promise to fight “corrupt career politicians” and a continued push for his “Turnaround” agenda – the platform of term limits for elected officials and business-friendly reforms that he ran on in 2014. Ives gave off an air of confidence headed into Election Day, promising to “upset the apple cart” with a victory. A West Point graduate, Ives has represented Wheaton in the Illinois House for five years. GOP voters heard his call and chose to send Rauner on to the general election, which may be one of the most expensive in the country’s history. 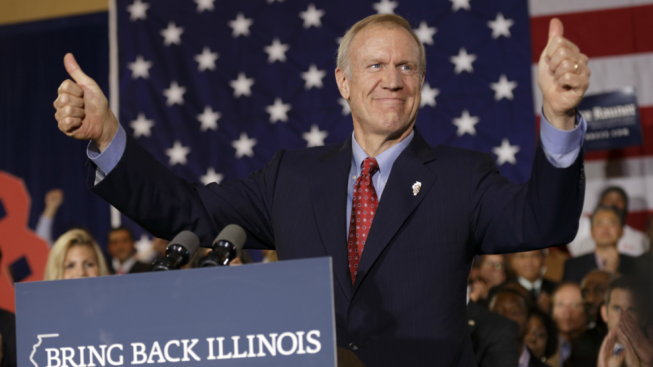 A billionaire businessman, Rauner spent $65 million on his 2014 gubernatorial bid, then turned around and raised more than $70 million for his re-election - $50 million of that from his own pocket in a single Dec. 2016 contribution. Rauner will now use that war chest to face Pritzker, who claimed an early victory in the Democratic race, in the general election in November - a race that's shaping up to be one of the most expensive in the nation's history.